Units - (Imperial) Units - (Metric) Cage Size: 2.5 cu. ft. If you plan on buying a cage for a single ferret, you will need to get one that has at least 2.5 cubic feet of internal living space. 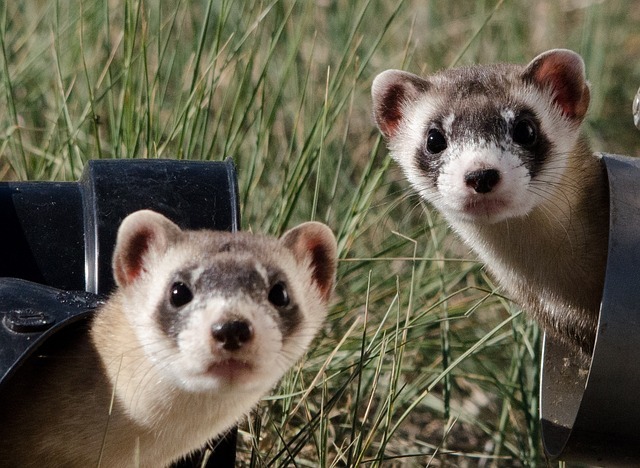 If you want to house two ferrets, then you will need a cage that has an internal volume of at least 5 cubic feet. 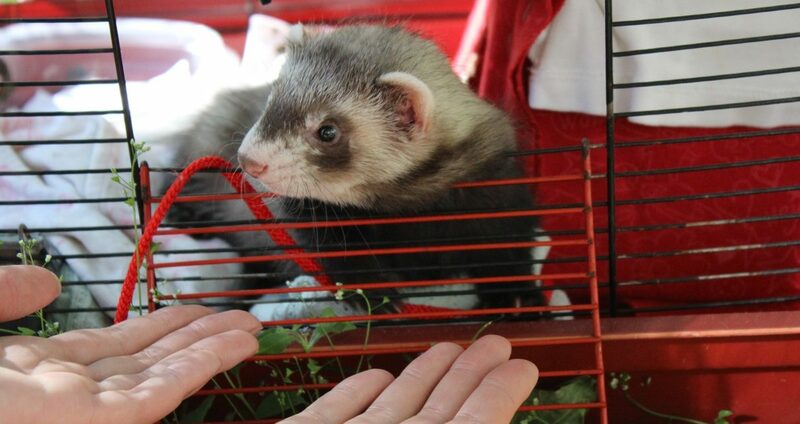 Finally, three ferrets will need a 7.5 cubic foot cage at a minimum. 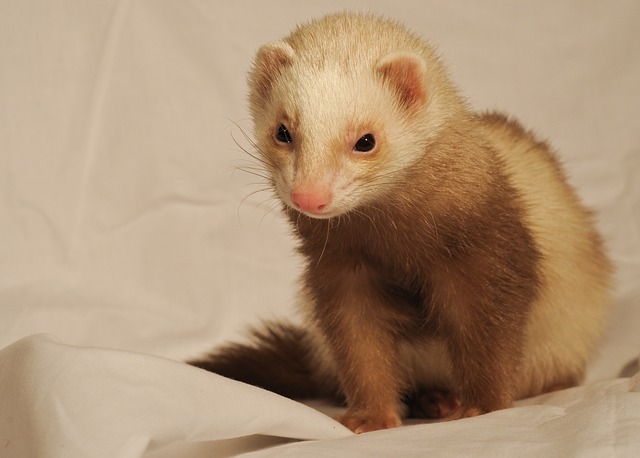 If you plan on keeping more than three ferrets, you can refer to the ferret cage size calculator located above, which should help you figure out what size cage you will need for your ideal ferret cage setup. 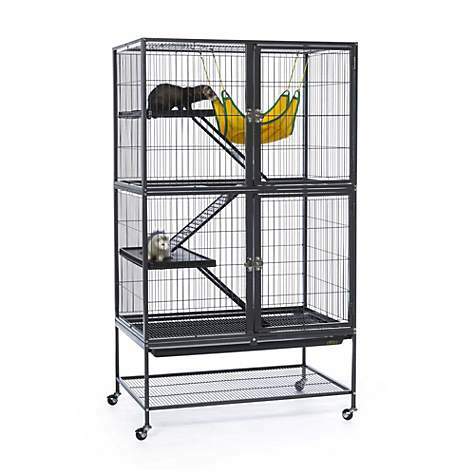 The Prevue Hendryx Corner Black Ferret Cage (Buy Online) is the perfect cage for a person with a large ferret family. 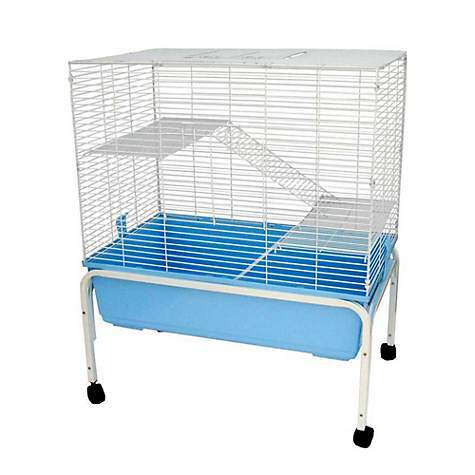 This extra large ferret cage has an internal volume of approximately 26 cubic feet. That makes this cage large enough to house a maximum of 10 ferrets, or 5 to 8 ferrets quite comfortably. This cage comes fully equipt with four ramps and four separate platforms. There is also a removable wire mesh grille located on the bottom level. If you remove the wire mesh grille for any reason, the litter pan has a built-in locking mechanism to keep your ferrets from pushing the litter pan open. The high level of craftsmanship and engineering found in the interior of this cage extends to the exterior as well. Not only is this cage absolutely gorgeous, it also has a lot of nice features for its human users. First, there is a very spacious shelf built right into the stand. This shelf can be used to hold food, litter or any other toys and accessories. The stand of this cage also comes with built-in casters, so even though this cage is quite large you won’t have any trouble moving it for any reason. Another very nice feature of this cage is that its wedge-like shape is made to slide unobtrusively into the corner of a room. This space-saving design means you can provide your ferrets with a large living space without having to sacrifice that much of your own. The Marshall Pet Products Folding Ferret Mansion (Buy Online) offers a generous amount of living space for such an affordable cage. This cage has an internal volume of approximately 25 cubic feet. That makes this cage large enough to house up to 10 ferrets, or you could be a little more conservative and keep 5 ferrets in this cage, and in that case, they actually might feel like they are living in a mansion. This cage comes with 3 very large ramps and platforms which are perfect for your ferrets to climb on and explore while they are in their cage throughout the day. There are also three large doors on this cage, so you will always be able to get easy access to your ferrets no matter what level they might be on in this very large cage. The Marshall Pet Products Folding Ferret Mansion also has built-in casters, which means you can easily roll this cage from room to room in order to give your ferrets a change of scenery. In addition, when this cage is not in use, it will collapse down to a small size for easy storage and transport. The Midwest Ferret Nation Double Unit Ferret Cage (Buy Online) is an extra large ferret cage that has a well designed internal layout. This cage boasts a total internal volume of approximately 23 cubic feet. That makes this cage large enough to hold a maximum of 9 ferrets. One of the real standout features of this cage is the spacious platforms. These platforms are made of durable plastic, which unlike wire mesh platforms will protect your ferret’s feet from potential injury. There are a total of 4 levels in this cage, two of them take up the full length and width of the cage. While the other two platforms cover about one-third of the footprint of the cage. Each level of the cage is easily accessible for your ferrets. 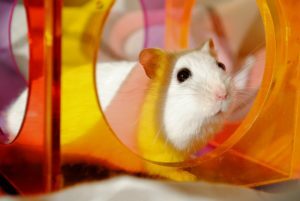 Your ferrets will love climbing up the gentle slope of the plastic covered ramps. These ramps come with a removable textured plastic ramp cover with a non-slip pattern which offers excellent grip and traction. Besides having lots of things your ferrets will absolutely love, this cage also has some nice features for its human users. First, you will be able to gain easy access to this cage thanks to the two sets of double doors located on each level of the cage. The Ferret Nation Double Unit cage also comes with built-in casters located on the bottom of the stand. The casters will allow anyone to move this cage around with ease, no matter how strong they are. In addition, the built-in stand comes with a large shelf, so you will always be able to easily access any food, litter or cage accessories. 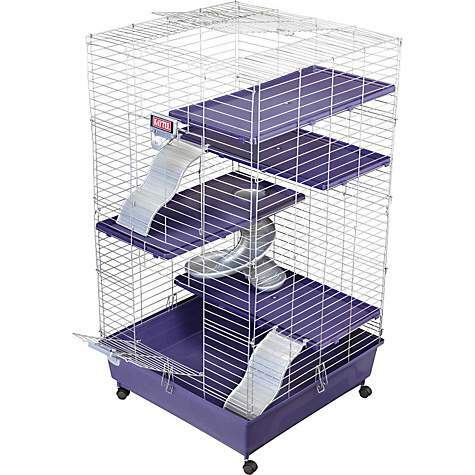 The Prevue Hendryx Four Story Ferret Cage (Buy Online) is a spacious ferret cage that has a great deal of vertical space. This cage has a total internal volume of approximately 15.4 cubic feet. That makes this cage big enough to house a maximum of 6 ferrets, or you could keep 3 to 5 ferrets in this cage in order to give each ferret some extra space. This cage is comprised of 4 separate levels, one of which is the ground floor which also acts as the litter pan for the whole cage. The litter pan has a convenient pull out drawer which will definitely help speed up cage maintenance. 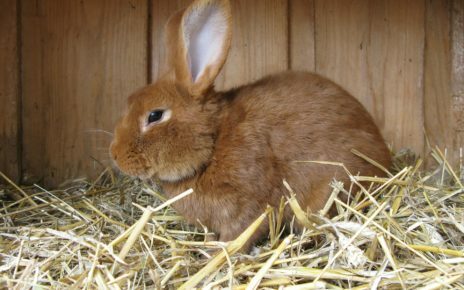 Moreover, the litter pan has very high walls in order to help keep any shavings or debris from escaping the cage. The other three levels in this cage are made up of three solid plastic platforms. These platforms are connected to each other by textured non-slip plastic ramps. If you add together the area of all three of the elevated platforms they nearly double the floor space of the whole cage. One of the really nice things about this cage is that even though it has a large internal volume it’s actually surprisingly compact. This is mainly due to the fact that the cages external dimensions are almost exactly the same as the internal living space. 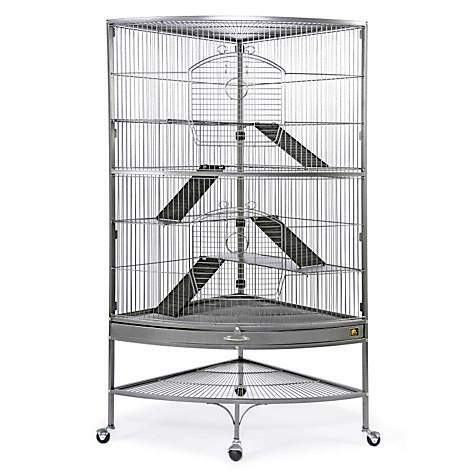 That means unlike cages with built-in stands this cage can fit into areas of your house that have limited vertical space. 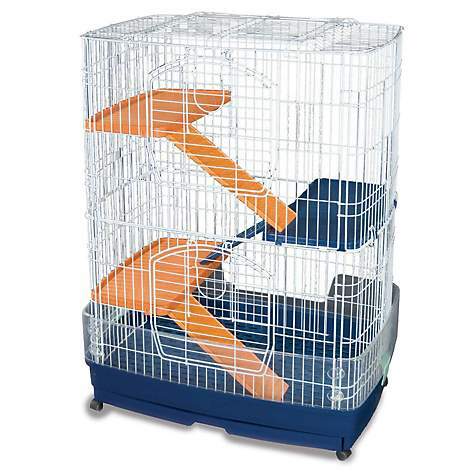 The WARE Living Room Series Ferret Home (Buy Online) is the perfect cage for anyone who wants all the features of an extra large cage in a more compact package. This cage has a total internal volume of just about 15 cubic feet. 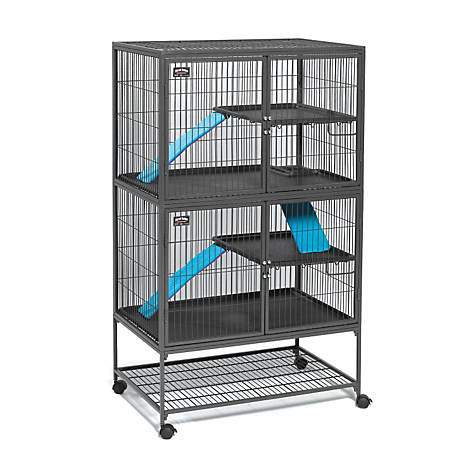 That makes this cage large enough to house a maximum of 6 ferrets, or at a minimum, this cage is perfect for keeping a small group of 3 to 4 ferrets. One nice thing about this cage is that the platforms can be snapped into place anywhere you want inside the cage. This versatility will allow you to layout the cage in any number of ways. The first level is fixed though, and it is made up of the litter pan which is a solid slide-out tray with deep walls, so any messes your ferrets make will be easy to clean. All the other platforms are quarter width, so if you want you can lay four of them side by side to create another full-size platform inside the cage. Two of the platforms have a hole in their base, so your ferrets will always be able to access any level even if you have four platforms seated together inside the cage. This cage also comes with casters built into its legs. 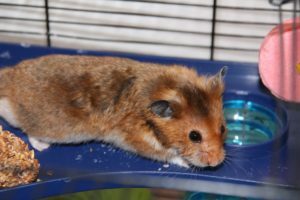 This will make it possible for you to move the cage around if you want to give your ferrets a change of pace, or the casters will be especially useful when you have to clean the cage. In addition, you will also be able to reach anywhere in the interior of this cage thanks to the two large doors that can be found on the side of this cage. 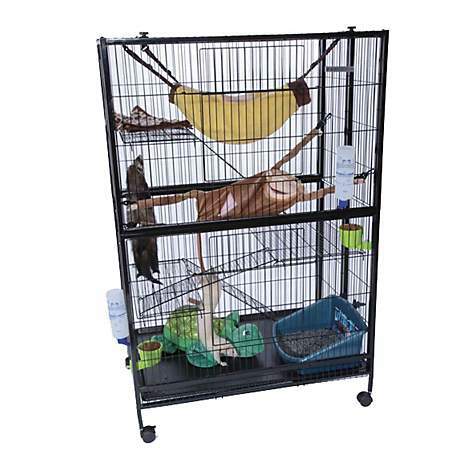 The Prevue Hendryx Black Feisty Ferret Cage (Buy Online) has a nice feature set and it is also one of the more affordable large cages on the market. This cage has approximately 15 cubic feet of internal living space. That makes this cage large enough to house a maximum of 6 ferrets, or you could keep 3 to 4 ferrets in this cage in order to provide each ferret with ample space. This cage has 4 primary levels connected by three ramps. Two of the levels occupy the full footprint of the cage, while the other two platforms are quarter width. 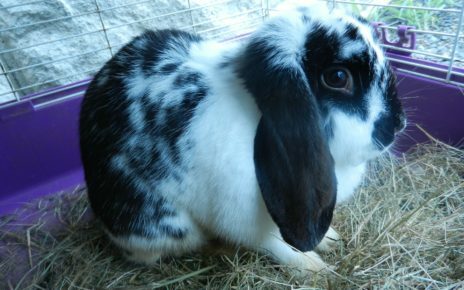 The first level is made up of a wire mesh floor that sits above the slide out litter pan. The other full sized platform is also made of a wire mesh, so any waste will conveniently fall through to the bottom level. The two quarter size platforms are made of solid plastic, which are connected to the main levels by plastic covered ramps. 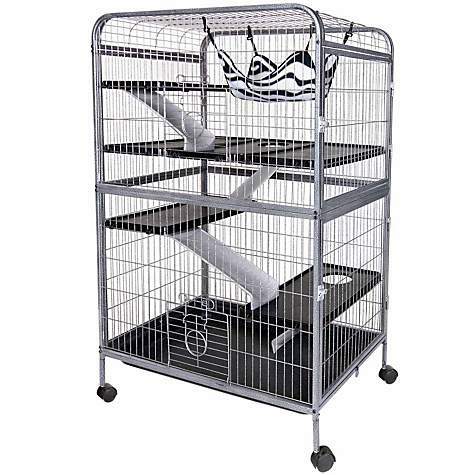 You also get a free ferret hammock included with this cage, so you won’t need to go out and buy one separately. This cage also comes with a stand with built-in casters, which will help increase this cages overall portability. There is also a built-in shelf located on the base of the stand that will allow you to store any food, litter, toys or other cage accessories you might need to keep your ferrets happy and healthy. 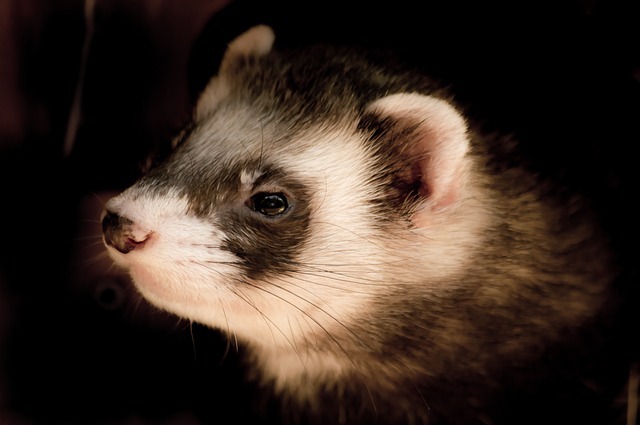 At a minimum, you will need a cage that has at least 2.5 cubic feet of internal space to house one ferret. 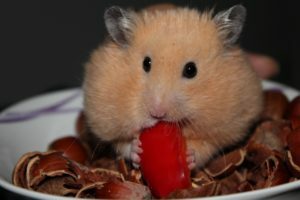 If you keep a ferret in a cage that is 2.5 cubic feet, they will need to be let out more often to stretch their legs and get some exercise. 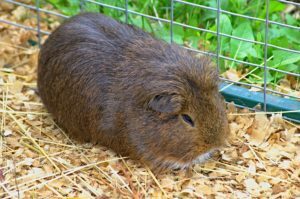 If on the other hand, you need to keep a ferret in their cage for the majority of the day, then a 5 cubic foot cage would be a better option. 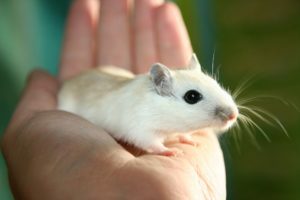 If you plan on keeping two ferrets together in the same cage, then you will need to provide them with a cage that has at least 5 cubic feet of living space. 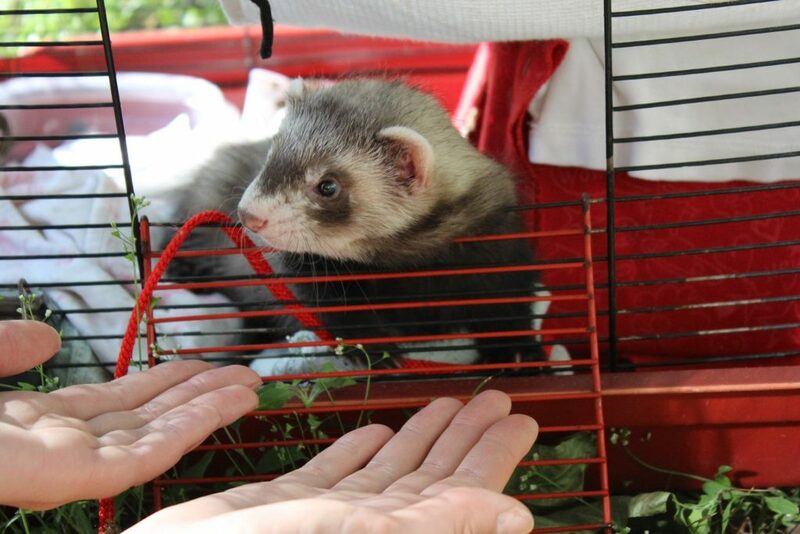 If you don’t plan on letting your ferrets out of their cage for most of the day, then you might want to consider getting an 8 to 10 cubic foot cage. If you want to get a cage large enough to house 3 ferrets you will need to get a cage that has an internal volume of at least 7.5 cubic feet. 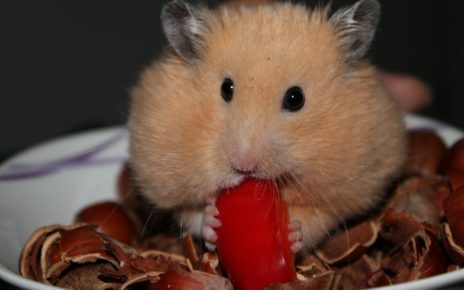 If your ferrets don’t spend most of their time in their cage then a cage this size will be OK. Otherwise, if you do plan on keeping your ferrets in their cage for most of the day, then you should probably consider getting a 12 to 15 cubic foot cage.